The wife and I popped in here late on Easter Saturday evening for a couple of beers to end the evening. I haven’t visited since it became the Falcon Tap and heard good things about it. The front bar was busy with not a seat available so we headed to the back bar which was almost empty apart from a few people stood at the bar chatting to a bouncer and the 2 bar men. 5 ales on the 6 hand pumps in the back bar, a decent selection of ales and abv’s, I opted for a few pints of Saltaire Kardinal @ 5.7%, a new beer for me and thoroughly decent. We stayed for just over an hour, had a couple of drinks each then headed off. I like the Falcon but the back bar was a bit quiet and dull, will try the front bar area on my next visit. 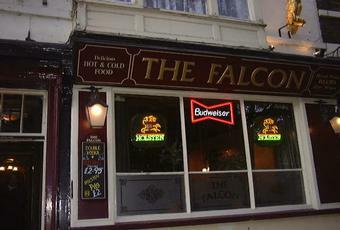 This pub has reverted to being called the Falcon, or rather the Falcon Tap. It has a small front room and a corridor leading to a larger rear bar where the real ales are located. These were Bad Co. Dazed and Confused, Arbor Monsoon Saison, Blue Bee Into The Void, Imperial Classical Bitter & Ramsgate Gadds Uberhop. Ciders are in the front bar and were Snails Bank Tumbledown Dry & Westons Old Rosie. There were 2 other customers in the rear bar on my Sunday evening visit. But they soon left, leaving just me and what looked like a very bored barman. The pub had looked much busier on the Saturday when I had passed by. But whilst the drinks range is good, maybe word of mouth hasn't been spread just yet. One to watch. 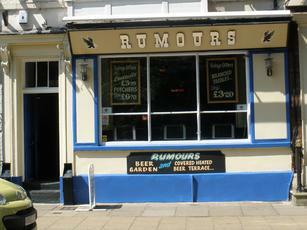 I saw RUMOURS, micklegate, york, uk on facebook and checked out their prices and beers etc. Very competitively priced so our stag party paid a visit and the place was very lively inside and outside the pub. Seperately managed pub to Nags, great looking and happy bar staff, good customer service and big enough outside beer garden to accomodate our large group. Will definitely visit again. Owned by the same management as Nag's Head next door, and is pretty much the same- yet strangely it's quite a bit more expensive. Nice upstairs outdoor seating area with heaters.